When asked to prepare dessert for a dinner party, I always want to spoil the host. A recent invitation to a friend’s dinner table was almost too easy. I know how much he loves raspberries and tarts. 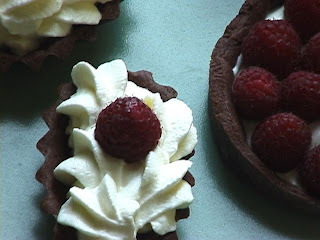 And although I had several ideas for things that would be exciting for me to experiment with, I realized that what would most please him is just a pile of raspberries nestled in a little pastry shell. Sometimes it's just that simple. So I got out of the way and let the raspberries carry on in their own perfect parade. Place the dry ingredients in the bowl of a food processor and pulse to blend. Add butter and pulse about 8 - 10 times to break up the butter into pea-sized pieces. Add the yolk and ice water and pulse a few more times until the dough begins to look crumbly. Finish the dough on a clean work surface using a motion called fraisage, which is smearing parts of the dough across the work surface with the heel or palm of your hand. This is a great technique that essentially flattens the butter and coats it in flour, producing that all-important flakiness. As with all pastry doughs, be careful not to overmix. Fraisage the dough just 3 or 4 times (depending on the amount of dough you're working with) and then use a bench scraper to gather and fold the dough back on itself. Form into a flat round, wrap in plastic and chill the dough until firm, at least 30 minutes. Let the dough warm up for a few minutes at room temperature. Roll between 2 pieces of parchment to an 1/8 inch. Line tart pans, patching as you go if necessary. Chill the shells for at least 20 minutes. Preheat the over to 350 degrees. 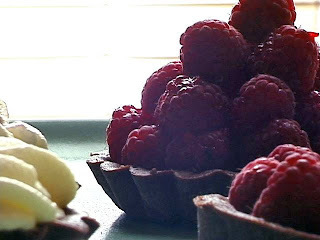 Prick the bottom of the tart shells with the tines of a fork and place on a baking sheet. Bake for 12 to 15 minutes, rotating the baking sheet halfway through the baking time. The surface of the tart sheets should appear dry and firm to the touch. Cool completely. Whip 1 cup of crème fraiche or heavy cream with 1 T sugar until medium peaks form. 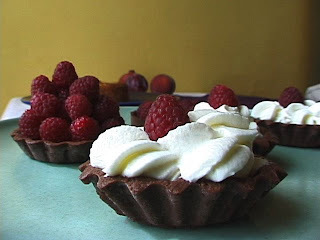 Fill the tart shells halfway and top with berries. Stand back and hail the parade. The magnificent Plum Family is about to pack up and leave town soon. You know what that means. To the kitchen! 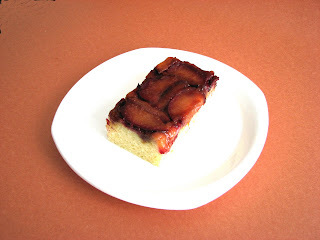 Time for a plum tart, plum galette, plum ice cream, plum soufflé, or perhaps a Plum Upside Down Cake. 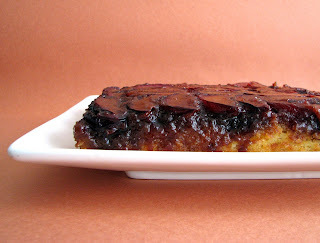 One of my first memories of plums comes from my grandmother’s homemade plum jam. Deliciously tart and sumptuous, sometimes she would bake little turnovers filled with it. I loved the color, I loved the texture, I loved the bright flavor. This cake was one that was baked often for the Café upstairs at Chez Panisse, sometimes topped with cranberries and oranges later in the season. It’s a very light and delicious cake with a delicate melt-in-your-mouth crumb. A perfect bed for beyond-your-wildest-dreams pure pleasure plumminess. And I hope you’re not afraid of the dried plummy maturity of prunes, because they may be keeping us company some of the time as we float into fall and settle in with the heady fragrance of warm spice cakes and little pastries. I can see it all now……Buck up! - This recipe is a hybrid from the Chez Panisse Café Cookbook and a version from David Lebovitz. - The lightness of this cake comes from gently folding in the egg whites. Blend thoroughly but be careful not to overwork the batter. - If you’d like, embellish with whipped cream flavored with a plum eau-de-vie, good quality brandy or whatever suits your mood. Adapted from Chez Panisse Café Cookbook and Room for Dessert by David Lebovitz. Place 2 oz of butter in a 9-inch cake pan and melt over low heat. Remove from heat, stir in the brown sugar until moistened and pat into an even layer. 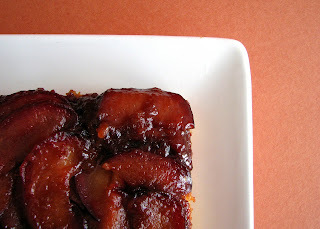 Slice the plums into thin wedges and arrange as you like on top of the brown sugar and butter mixture. Set aside. Cream butter and sugar until light and fluffy, about 4 minutes, scraping down the sides of the bowl as needed. Add vanilla and blend. Beat in yolks one at a time, mixing thoroughly after each addition. Add a third of the flour mixture alternately with the milk, beginning and ending with the flour. Scrape down bowl to be sure everything is incorporated. Whisk the egg whites with the cream of tartar until they are stiff enough to hold a very soft peak. Fold the whites into the batter a third at a time. Carefully spread the batter evenly over plums. Bake for about 55 minutes until a toothpick tests clean. Run a thin knife around the edge of the pan to loosen cake. Cool in the pan on a wire rack for 25-30 minutes to let the fruit set up. Invert onto a platter. Revel in the wealth of so much plumminess on one plate. I’m feeling it! While we’re still in the fleeting moments of fig season, I have another figgy thought and it comes from Lindsey Shere’s Chez Panisse Desserts. 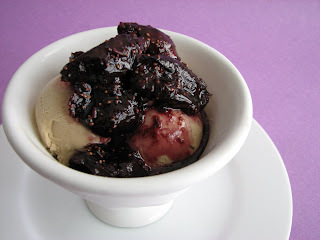 Provençal Sundae is an ethereal dessert of coffee ice cream that beams with the crowning touch of a very unusual fig compote. Blending the spellbinding ingredients of honey, lavender and red wine, Provençal Sundae transports us to the flirty shores of the Mediterranean at first bite. What is it about ice cream? Each cool spoonful floods your mouth with the most incredible sensation, tremendously satisfying yet we desire just one more, one more, one more. If you don’t have time to make the coffee ice cream, please, please don’t let that stop you. By all means, buy your favorite commercial brand and drift into one of the most hauntingly delicious sundaes imaginable. A real daydream Sunday Sundae. - Lindsey took her inspiration for this recipe from Richard Olney, an ex-patriate in Provence. - Lindsey’s recipe calls for dried Calimyrna figs, but since figs are still plentiful right now, I must go with fresh. For fresh figs, I double the amount of honey to 6 T to compensate for substituting the dried figs, which have a higher concentration of sugar. - As for the red wine, I use a good Carménère with great results. Not exactly Provence, but why not invite Chile to the party? 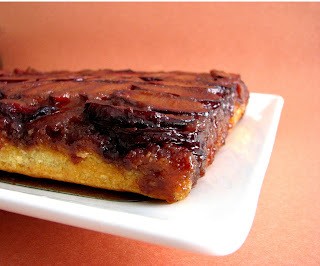 - The fig/wine sauce reduction should simmer on low heat to gently concentrate the flavors. Once it’s been reduced by half, the sauce takes on the consistency of syrup and is ready to serve once it's cooled. - When making the crème anglaise base for the ice cream, watch it closely. If you have an instant read thermometer, this would be a good time to use it. I tend to cook it to about 165 degrees, pull it off and keep stirring. Residual heat will usually take it to 170, which is about right. But you have to watch it very, very closely because at that point the temperature rises very quickly and when it's at 170 you have to cool it immediately on an ice bath. It's trashed at 180. Combine the half-and-half, cream, sugar and coffee beans in a saucepan over low heat. Let the mixture get fairly hot, but do not let it boil. Heat the mixture slowly and steadily to extract the full flavor of the coffee beans. Steep for about 30 to 45 minutes until the flavor suits you, then strain out the coffee beans. Set up an ice bath by filling a bowl full of ice. Place it in your freezer until you are about to start tempering the hot milk into the egg yolks. When you're ready to begin cooking the cream/egg mixture, nestle a clean bowl on top of the bowl of ice and set on a counter near your stove. Place a strainer in the bowl. Whisk egg yolks in a separate bowl. Temper a bit of the warm milk into the eggs in a slow steady stream, whisking continuously to blend the ingredients. When the egg mixture is warmed up, pour it into the saucepan, return it back to the stove and cook over medium low heat. Keep stirring constantly until it coats the back of a spoon and when you run your finger through it, the line holds. Do not let the mixture boil or you will have a scream-inducing mess of sweet coffee flavored scrambled eggs. Once it coats the back of a spoon, strain immediately into the bowl set over the ice bath. Once it has cooled down, chill the mixture thoroughly. When ready to spin in your ice cream maker, add vanilla to taste and freeze according to your machine’s instructions. Bring the wine, water, honey, lavender and figs to a simmer. If you’re using dried figs, cover and cook slowly until the figs are soft. This could take 30 minutes or more. If you’re using fresh figs – and I implore you to do just that! - cook for about 15 minutes until the figs have warmed and absorbed some of the wine sauce. Remove the figs and simmer the sauce on low heat until it is reduced by half to a syrup. Pour over figs. To serve, place a scoop or two of coffee ice cream in your favorite dish and top with a few fig halves. Drizzle with syrup. Proceed to be whisked away to the villages of Provence. If you ever want to have some silly fun, whip up a batch of meringue. As far as the basics are concerned, it’s a great lesson on whipping egg whites and one where you can immediately see the enchanting results – billows and billows of white clouds that look like they’re about to float far, far away into the stratosphere. Meringue is a fundamental pastry tool you can use to garnish a pie or a tart, make marshmallows, pipe meringue cookies, create some faux mushrooms for your Bûche de Noël or fashion an airy Pavlova. A dessert created for Anna Pavlova, the famous Russian ballerina of the early 20th century, the Pavlova is a light cloud of meringue that is dried in the oven and typically topped with whipped cream, fresh strawberries, passion fruit, and kiwi. But create your own favorite fruit combinations. Here I use fresh berries because they were calling out to me at the farmer’s market and because I love them. Unequivocally. - Egg whites are easiest to separate when cold, but achieve their best volume at room temperature. - There are three methods for making meringue: whipping the egg whites when they are at room temperature (Classic Meringue); warming them with sugar before they are whipped (Swiss Meringue); and whisking in a cooked sugar syrup after they’ve been whipped (Italian Meringue). They all have different uses and when you vary the level of sugar added, you get variations in the final texture. Bake a cloud of meringue at a low temperature for a couple of hours to dry it out and it becomes a crunchy dessert element for added texture. - When whipping egg whites, fat is the enemy. Be sure your mixing bowl and whisk are clean, dry and free of any fat. For example, there should not be any traces of egg yolk, butter, oil, nuts, or chocolate present. If there is even a speck of fat, egg whites will not whip. At all. Minutes will tick by and you will have a soupy mess. However, once they’ve been successfully whipped to a stiff peak, you can carefully fold in chopped chocolate or espresso, for example. Or fold in nuts to create a disc of dacquoise. - Most recipes for meringue include salt and/or an acid. A pinch of salt helps to firm up the egg protein. 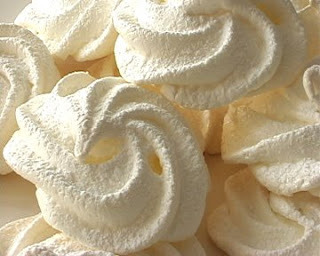 An acid, such as cream of tartar, lemon juice or vinegar, stabilizes the meringue by preventing the bubbles from bursting once you stop beating. Cream of tartar is an acid salt. - Once egg whites are whipped to the desired consistency, work quickly to use them as intended. They will start to deflate if allowed to sit. 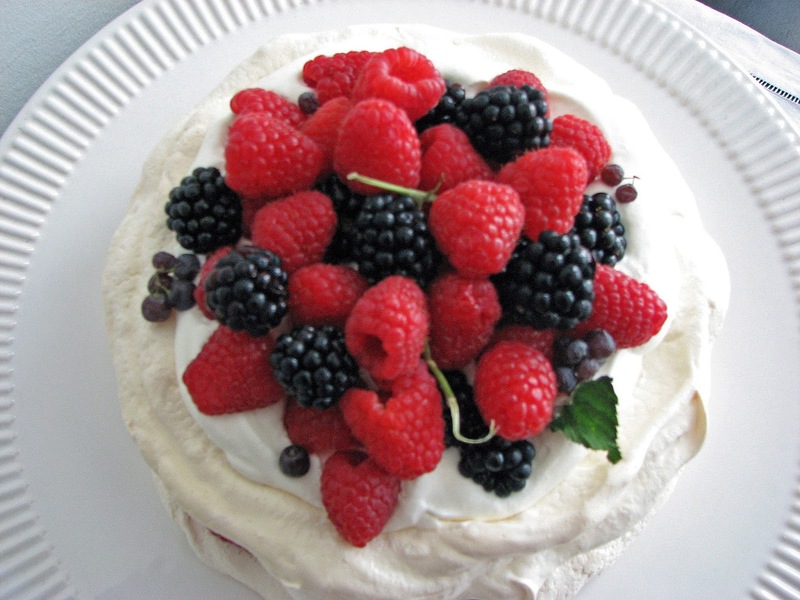 - You can make smaller Pavlovas for individual platings or pipe bite-sized meringues filled with crème fraiche and topped with a berry. 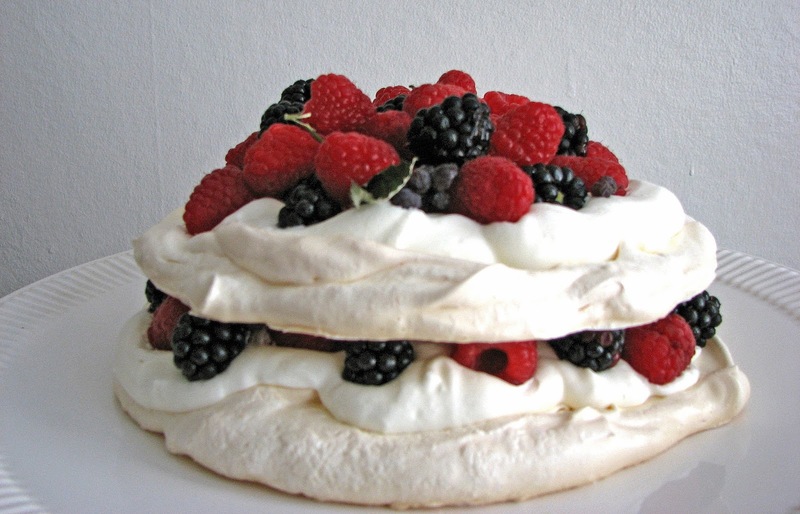 - An optional raspberry sauce or coulis adds an additional layer of fruity tartness to balance the sweetness of the Pavlova. Preheat oven to 180 degrees. Trace two circles with an 8” diameter on a piece of parchment paper using a dark pencil. Place parchment pencil side down on a baking sheet. Place the egg whites in the bowl of an electric mixer and whisk on medium low speed. Add cream of tartar when they are foamy. Increase speed to medium high and continue whisking until they form a soft peak. Slowly add sugar a couple of tablespoons at a time and continue whipping until meringue forms very stiff shiny peaks that hold their shape. Drop meringue by spoonfuls onto the parchment-lined baking sheet. Spread to the penciled outlines, using a light touch and letting it take its own cloud-like form. Place in the oven and bake for about 1 1/2 to 2 hours or until meringue easily releases from the parchment. Turn off the oven, leaving the oven door closed, and continue to let meringue dry while the remaining ingredients are prepared. 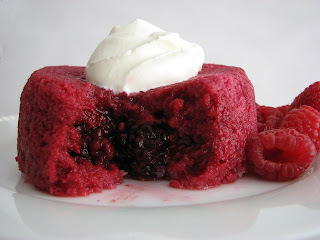 Place 1 pint of raspberries in a blender or food processor and puree. Add sugar to taste and a splash of lemon juice and blend thoroughly. Taste and adjust sugar and lemon juice as necessary. Strain into a container and set aside until ready to serve. Whip the cream. When it starts to thicken, add the sugar and vanilla and continue to beat just until it forms soft peaks. Place a disc of meringue on a serving platter. Spread a layer of cream and distribute half the berries. Top with the second meringue and a second layer of whipped cream and berries. 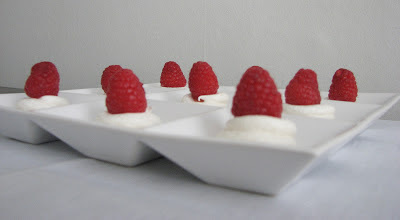 Serve immediately with raspberry coulis on the bottom of each plate or on the side.